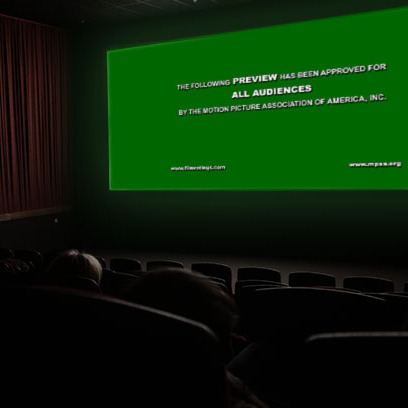 On Tuesday, the National Association of Theater Owners (NATO) made some news by issuing voluntary guidelines that, among other things, called on film distributors to limit their trailers to two minutes maximum, 30 seconds shorter than the current standard. Some welcomed the news. “Trailers are becoming too long, giving away too much and stuffing in too many extraneous and confusing elements,” argued Ben Brock over at the Playlist. Scott Mendelson, at Forbes, wrote, “Very few movies need those full 2.5 minutes to make the sell. The end result of the copious and lengthy trailers is to do little more than just give away more and more of the film purely out of needing new footage to show.” And a few critic friends I spoke to agreed with this sentiment, also bothered by the fact that movie trailers have gotten longer and longer, and give away more and more plot details. Plus, trailers nowadays hew to a structure so commonplace and cliché that it was beautifully skewered last year in Eterna, Vadzim Khudabets’s brilliant, hilarious, and even occasionally rousing montage of trailer moments. And, what’s more, I love long trailers. Teasers are great and all, but there’s actually something beautifully aspirational about a longer trailer. For example, I always admired the nearly three-minute trailer for How Do You Know, which, instead of just showing us a whole bunch of out-of-context shots from the movie, actually gave us snippets of scenes that accurately convey the kind of movie it is. It’s a totally unremarkable trailer, but it works, in part because it takes its time. On a cruder level, this red-band trailer for The To-Do List, which runs well over three minutes, does the same. In fact, that trailer does a better job of conveying the entirety of The To-Do List than the movie itself (which, admittedly, I liked). It’s an idealized version of the film – an expression of the movie’s best self. Of course, there’s a fine line between portraying the movie accurately and giving away too much of it. By about the 500th time I saw the trailer for last year’s The Call, which tells us way too much, I was ready to give up on all trailers forever. But all these concerns are nothing new. Trailers, which are so called because they originally came at the end of a film, have gone through many different iterations over the course of their 100-plus-year history. (David Fear did a pretty thorough historical overview of the movie trailer over at the Dissolve last year.) Many would have us believe that the trailer that gives away too much of a movie’s plot is a new phenomenon, but it’s not, really. Check out this one for the John Ford classic The Searchers, which reveals several of the movie’s climaxes, as well as its subtextual (and, in the film, rather subtle) love affair. Or, for that matter, this trailer for Casablanca. Of course, we don’t get this kind of creativity and innovation with trailers nowadays. Most of them, while entertaining enough, stick to the here-are-a-bunch-of-awesome-shots-from-the-movie-with-some-indie-pop-song-or-the-music-from–The Thin Red Line–playing-over-it approach. (See the recent promos for X-Men: Days of Future Past or 300: Rise of an Empire.) And one could argue that the main reason for that is because they have to stick to these industry-standard lengths. Yes, you can be just as creative at two minutes as you can be at five, but I fear that forcing trailers even further to stick to a prescribed length will simply reinforce the phenomenon of the cookie-cutter trailer. If you want to fix today’s trailers, open up the limits on how long they can be. Give the people cutting them, and the filmmakers, more freedom, not less. You might be surprised at what they come up with.